Send someone special on a trip to paradise with this radiant bouquet of dramatic pink blooms. 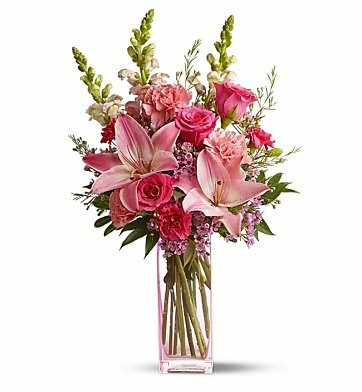 A tall glass vase holds a pink profusion of Asiatic lilies, carnations, snapdragons, roses, and waxflower. Standing nearly two feet tall, the bouquet is sure to make a grand impression on anyone who receives it. Measures approximately 12" x 21". Pink Paradise Bouquet is a hand delivered gift. These gifts are delivered by one of our local design centers located throughout the United States and Canada. Same day delivery is available for most gifts when ordered before the cutoff time. The cutoff time for Pink Paradise Bouquet is 2 PM in the recipient's time zone. I did not see the flowers, but my mother said they were very beautiful. When these arrived, I was so impressed with how fresh and lovely this arrangement looked. They lasted 10 days, and I am a very happy customer.